As long as you have downloaded 7-zip on Windows 10, there will be a CRC SHA in Context Menu. Every time you right click a file, a folder, you can see the 7-zip and CRC SHA in the right-click menu along with CRC-32, CRC-64, SHA-1, SHA-256 and * options. For some people you do not care about CRC SHA and feel like to remove CRC SHA from the Context Menu in Windows 10, you may as well manage to follow the step shown in the following content. But here to let you know more about your 7-zip program, at the very beginning, you would better learn the concept of CHC SHA in Context Menu on Windows 10. CRC SHA is an important function of 7-zip program. Among it, CRC is stand for Cyclic Redundancy Check, which is to detect changes of data in the digital network. On the other hand, SHA stand for Secure Hash Algorithm. 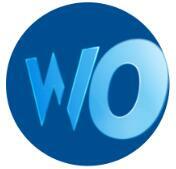 It focuses on making sure the integrity of the data online and ensuring there is no corruption in the data. From this perspective, you can see the CRC-SHA Context Menu is important in the 7-zip. While if it is your wish to disable CRC SHA Windows 10 from the Context Menu, move on to the details. And this is not only on Windows 10, it also applies to Windows 8.1, Windows 8 and Windows 7. How to Remove CRC SHA From Context Menu on Windows 10? At the moment you do not want this CRC SHA in right-click menu, now you are able to remove this entry from Context Menu in Windows 10. 1. 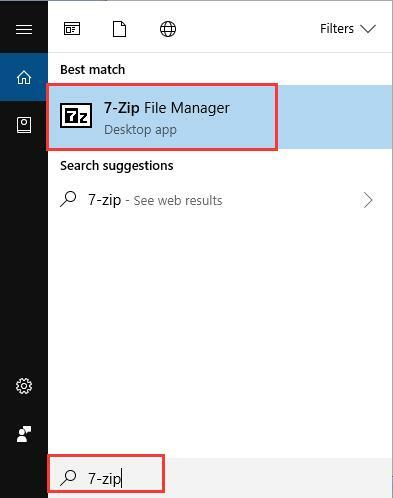 Type in 7-zip in the Start search box and then hit Enter to go to 7-Zip File Manager. 2. Then in 7-zip, under Tools, choose Options. 3. 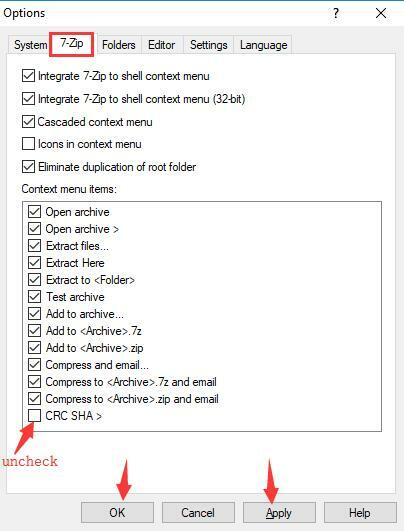 In Options window, under 7-Zip, in Context menu items, uncheck the box of CRC-SHA > and then click Apply and OK to save changes. That is it! 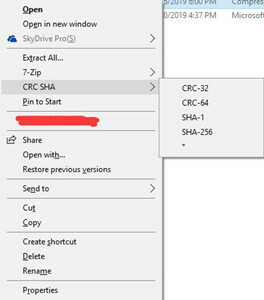 Now you can attempt to right click a folder or file, it is likely that the CRC SHA entry, like CRC SHA md5, in removed from Windows 10 Context Menu. So if you experienced CRC SHA download and used the 7-zip, but occurs to CRC-SHA removal Windows 7, you can refer to the procedures above. Or if you encounter an event was unable to invoke any of the subscribers, you might as well decide to disable 7-zip from Context Menu. It is also available for you to make the best use of CRC-SHA tool to ensure the safety of the data in 7-zip. Above all, go with the steps to try to get rid of the CRC SHA from right click menu on Windows 10. Here if you have no idea about this 7-zip entry, it is also feasible that you consult what has been described in this article.